How aware are you of the quantities of prescription medication that are currently in your home? Would you know if some of your pills were missing? From this day forward, make sure you can honestly answer yes. If your child has been prescribed a medicine, be sure you control the medicine, and monitor dosages and refills. You need to be especially vigilant with medicines that are known to be addictive and commonly abused by teens, such as opioids, benzodiazepines and stimulants. Make sure your friends, parents of your child’s friends, neighbors and relatives — especially grandparents — are also aware of the risks. Encourage them to regularly monitor their own medicines in their own homes. Take prescription medicine out of the medicine cabinet and secure them in a place only you know about. If possible, keep all medicines, both prescription and over-the-counter, in a safe place, such as a locked cabinet your teen cannot access. 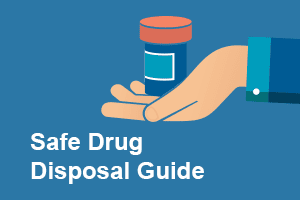 The ideal way to do this is by participating in a safe drug disposal program – either a drug take-back day, an ongoing program in your community, a drug deactivation bag, or a drug mail-back program. To find a take-back location or event near you, visit the American Medicine Chest Challenge or the DEA website. If none of these options are available to you, unused medicine can be disposed of at home as a last resort. Mix the medicine with an undesirable substance, such as used coffee grounds or kitty litter, and discard. Unless the directions on the packaging say otherwise, do not flush medicine down the drain or toilet. To help prevent unauthorized refills, be sure to remove any personal, identifiable information from prescription bottles or pill packages before you throw them away. Kids who learn about the dangers of drug use early and often are much less likely to develop addiction than those who do not receive these critical messages at home. Parents and other caregivers have an incredibly important role to play. We can all take action by having frequent conversations with the teens and young adults in our lives about the dangers of substance use and medicine abuse. But we know these conversations are not always easy. In fact, they can be really challenging. We offer the tips and tools you need to start the conversation. Emergency preparedness is always a good idea. Naloxone (known by the brand name Narcan) is a medication that can prevent overdose deaths from opioids. Learn how to obtain and use this life-saving medication. Natural or synthetic, illicit or otherwise – opioids act on the body’s opioid receptors and carry high risks of dependency, addiction and overdose.